Welcome to cold and flu season, folks! Yep, it’s that glorious time of year where a single sneeze could mean that you and your entire family are sniffling for weeks. It’s a balancing act. How do you keep your child and their friends at school healthy while making sure they don’t miss too many classes? Well, first and foremost, if you are concerned about your child’s health and aren’t sure what to do, stop in for a visit. Below are just some basic guidelines for when to tell your child to tough it out and go learn, and when to make them some chicken soup and put on “The Princess Bride”. When your child has a fever, the first question to ask is not “How high is it?” but “Why is it there?” A fever of 101 degrees can actually be more threatening than one of 103 degrees, depending on what the accompanying symptoms are. Even if your child has a low grade fever, if they are also exhibiting decreased activity, vomiting or have diarrhea, you want to keep them home from school and perhaps even give us a call if the symptoms don’t subside. If, however, your child’s temperature is below 100 degrees and they are lucid and aware, it is probably alright to send them off to school. Yep, you guessed this one. If your child is dealing with this oh-so-pleasant bug, this is a sure sign that they need lots of rest and fluids, and definitely need to stay home. If the symptoms persist, worsen, or are accompanied by fever, give us a call. 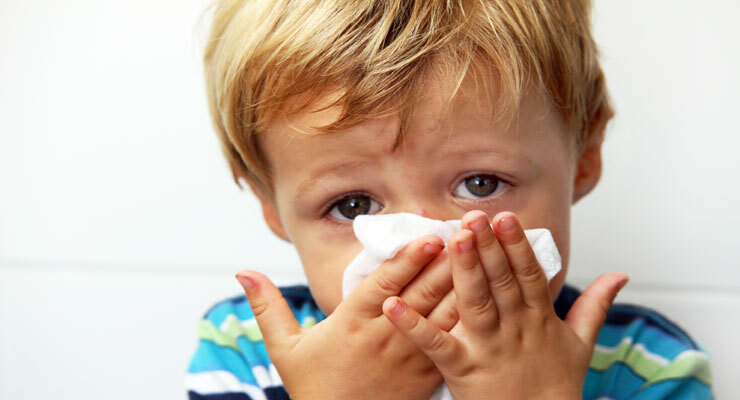 Runny noses and coughs alone are usually not enough to warrant staying home from school. But, if your child is weak, tired, or achy on top of that, it may be. Trust your gut. If you do decide to send them out into the world, make sure they’ve gotten enough sleep, have their own water bottle so they aren’t sharing with anyone, and remind them to wash their hands frequently to prevent spreading it around.